Want to keep in contact with friends and family without having to sell your personal data? Review It's become a phrase repeated so frequently, it almost feels like a cliché: if you're not paying for the product, you are the product. The truth is that hundreds of millions of us put up with the unpleasant fact that chunks of our personal lives – our photos and emails and whereabouts and contacts – are combined and packaged to sell ads by Facebook, Google, Twitter et al, because they provide people with what they want. And that is: quick, easy seamless connections to the wider world and in particular friends and family. Well, there is now a solution. Or, more accurately, a potential solution that we've decided to try out: Loop. A gizmo for streaming pics and videos to your kitchen, or wherever you place the thing, and video conferencing with faraway relatives and pals. Loop looks like an old-school-looking box that is portable in the same way that radios in the 1960s were portable. It is, we must say, a pleasant combination of modern styling and materials with retro dials and knobs, and it hopes to be the low-key, comfortable solution to modern connectivity. Loop opts out of modern and potentially intimidating user interfaces, which rely on endless numbers of new apps and clicks and swipes, and goes instead for a simple metal-turning-knob and a TV-style concept of internet channels. You can add your own channels – whether pulling in pictures from your Instagram feed, or uploading photos directly to a custom Loop channel, or adding a YouTube channel, or selecting one of Loop's own channels – and then switch between them. Those pictures, videos and also direct one-to-one video conferencing connections are all displayed on a 10-inch flat screen that makes up the whole front of the device. It actually looks and feels like the kind of space-age 21st-century that was enthusiastically shown to families in the 1970s, along with the self-cleaning laundry basket, automatic lawn mover, robot butler and flying car. It has a camera, speakers, a microphone, a leather handle at the back, and a very, very simple interface that your grandparents or child can use. And that is the core market for the device: people who are too young or too old to figure out, or want to figure out, how the iPad works when all they want is to use Facetime or look at pictures. What Loop will do is connect you, directly, to a small number of family and friends and let you share pictures and video, as well as chat over video – without leaking private stuff out to the larger internet and without exposing all the details of your life to a mega corporation seeking to sell ads. It's designed to keep your stuff automatically and by default between just you and your inner circle. This is a lovely quaint idea. And it takes a little time to get used to the concept of such a pleasantly innocent device on your surface. 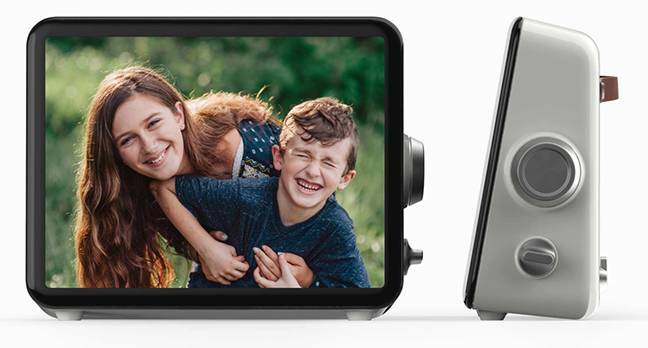 Unfortunately, it also has a long way to go, with so many small niggles and irritations that we couldn't imagine parting with $299 for the device (or $199 each if you buy three of them). At least not until most of them were fixed. Being a tech news site, we get to have conversations with the people that build these products. So this reviewer spoke at length with San Francisco-based Loop's CEO Brian Gannon about the issues and approach, and what the upstart is hoping to achieve. "The idea of it is to help families stay connected," he told us. "The service and the device are all designed to reduce friction." Like any middle-aged man in 2017, Gannon is sat in the middle of the technology spectrum: responsible for helping kids navigate the risks of being constantly connected, and for helping parents and grandparents make sense of the baffling array of buttons and apps. He gives the examples of pictures, which every family loves sharing. You first set up an online space and add photos. You often make sure it is private. And then you have to direct everyone else to it, often walking them through the app or service you decided to you. "It's complicated," he complained. Loop hopes to avoid all that by having things just pop up and work. The device's steady state is very similar to those digital photo albums, displaying slow transitions between pictures. But if your parents have your Loop channel on their device, any pictures you add will simply appear. And new ones pop up automatically. The metal rotary interface is "fun and easy", he said, and lets you quickly move between channels. For video conferencing, you simply turn the dial until the name of the person you want to talk to appears and it will put a call through to them – either to their own Loop device or the Loop app running on their phone or tablet. To his credit, Gannon acknowledged all these small annoyances, and pointed out that it is early days for the startup, which emerged with its gadget in hand last year. He argued, convincingly, that almost everything is fixable through a software update. At the moment, updates on the device are going out every week, bringing new features and addressing bugs, we're told.